Offroad ABS: The Offroad ABS mode allows the rider to block the rear wheel as and when required - a prerequisite for committed offroad riding and deliberately executed slides. The ABS function remains active on the front wheel, unless you turn it off entirely. Offroad TC: The Offroad TC mode allows up to 100% slippage - i.e. double rear wheel speed - for ambitious offroad use. Turn it on and master controlled drifts with ease. The benchmark: The KTM 1290 SUPER ADVENTURE R sets new performance standards: 160 hp and a weight of only 240 kg (ready to ride - fully fueled) produce a power-to-weight ratio previously unheard of in this class. The dynamics are stunning. At the same time, the powerful yet cultivated engine enables either particularly relaxed riding or, if required, super-sporty propulsion - with every conceivable level in between. The chassis combines lightness with outstanding geometry and suspension, which, together with every electronic riding aid we could muster, allow undreamed of riding pleasure in all conditions, at whatever speed you desire. From very relaxed to very, very fast. Multitalented: Laid-back touring? No problem. Scorching up and down the backroads? Yes, please. Feel free to throw in a big, bad stretch of dirt on the way. This extremely wide application range is made possible by the ground-breaking electronics package featuring Bosch MSC. And what’s particularly impressive is that the KTM 1290 SUPER ADVENURE R’s different guises result in virtually no perceptible compromises. When you ride relaxed, the bike follows suit. There is no overly sharp responsiveness or a taut chassis setup. But if you do want to turn up the wick, you won’t find yourself riding a rocking horse either. The bike’s many riding modes seamlessly fit to wherever you might find yourself. Whether that’s an alpine pass, a bone-shaking track, winding curves or simply the urban jungle, the KTM 1290 SUPER ADVENTURE R is the ultimate Travel Enduro for adventures on all the world’s roads. From the backyard to the outback. Seat: This is where you’ll - hopefully - spend a lot of time, so the seat has to provide support, feedback and freedom of movement. Thanks to KTM’s state-of-the-art 3D foam padding, the KTM 1290 SUPER ADVENTURE R has your back. No matter if you ride it to the local shops or the ones across the Sahara, both rider and passenger will get there in comfort. Adjustable windshield: The windshield’s height can be changed as quickly as you can change your mind, thanks to the easily operated self-locking winder. Multifunctional LED headlight: Form and function are integrated beautifully in the 1290 R’s design. Take this headlight, for example. The central aluminum part holds the LEDs and keeps the unit cool. It is flanked by two more LED strips: the daytime running lights. Another set of LED cornering lights round things off at the bottom. They use the lean angle sensor of the MSC system to adjust their intensity in real-time. Unlit corners? A thing of the past. With a KTM 1290 SUPER ADVENTURE R, the future is bright. Engine: Based on the 1,301cc V-twin of the KTM 1290 SUPER DUKE R, aka "The Beast", the KTM 1290 SUPER ADVENTURE R is clearly the Alpha in its segment. The engineers adapted the cylinders to a newly developed cylinder head and crankshaft to give this bike a powerplant that perfectly fits its sovereign appearance. It packs one hell of a punch for fully loaded tours, has truckloads of torque from the bottom up and hardly ever needs hurried downshifts. Therefore, the 1290 R is equally happy cruising around town as it is giving Superbikes a run for their money when the chips are down. With 160 hp and 140 Nm of torque on tap, of which 108 Nm is already available at 2,500 rpm, we wouldn’t bet against it. Slipper clutch: Not only does the slipper clutch open when the engine back-torque becomes too high, it also assists when you open up the throttle. The former prevents destabilizing rear wheel chatter when braking sharply or decelerating; the latter reduces the lever force required for changing gear, allowing the clutch to be controlled with just one trigger happy finger. DLC coating: DLC (Diamond-Like Carbon) is an extremely hard, durable and tribologically (i.e. in terms of sliding behavior) particularly well-suited coating that KTM uses in many parts (cam followers, piston pins, etc.). Our engines love it. Dashboard: The KTM 1290 SUPER ADVENTURE R supplies its rider with all necessary and desirable information on a state-of-the-art, clearly arranged 6.5" TFT display. Even in direct sunlight, core data is displayed clear and crisp thanks to its bonded, anti-glare surface made of a strong sheet of glass. But don’t worry about spots or smears; the anti-fingerprint coating has this covered. The screen also automatically adapts to ambient light levels and its angle is adjustable, so you won’t miss one bit of information. On top of the obvious data (speed, revs, fuel level etc. ), the computer can show a favorites menu with up to 8 adjustable features, an MSC ride modes overview and a riding conditions page (outside/oil temperature, onboard voltage, various trips, average speed, average and current fuel consumption, range and the distance to your next service). Crystal clear and easy to operate, even when you’re in a hurry. Waterproof USB phone socket: A waterproof compartment keeps your smartphone safe and dry on the road. It keeps it charged too, thanks to its integrated USB socket. Meanwhile, the optional incoming calls and audio function links the phone to the bike via Bluetooth. It’s always nice to let people know you absolutely have to take that enormous detour. Power-to-weight ratio: The combination of lightweight chassis engineering and a compact but powerful engine take the KTM 1290 SUPER ADVENTURE R to the top of its class in terms of power-to-weight ratio and ride dynamics. This fully equipped adventure bike tips the scale at 240 kg, while carrying a substantial 23 liters of fuel. 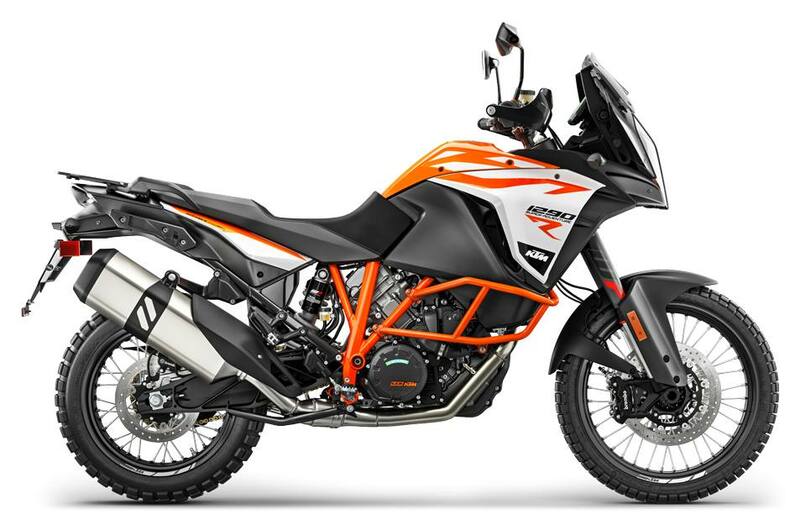 This makes the KTM 1290 SUPER ADVENTURE R - in typical KTM style - one of the lightest motorcycles in its segment. Add an outstanding geometry, well-balanced stiffness distribution and high quality suspension components and you end up with a true corner stormer. This also boosts safety, since it is far easier to fling a nimble motorcycle around a source of danger than a heavy one. Brakes: Precise. Powerful. Stunning. Just as you would expect from a set of Brembo brakes. Up front you’ll find twin 320 mm discs, radially mounted, 4-piston fixed calipers and a radial master cylinder. At the rear, excess speed is taken care of by a generously dimensioned 268 mm disc. And in case of an emergency, Bosch’s two-channel 9ME C-ABS speeds to the rescue. Stamina: The KTM 1290 SUPER ADVENTURE R is not only light, powerful and dependable; thanks to low fuel consumption, a 23-liter fuel tank and 15,000 km service intervals it also hardly ever needs to take a break. Quickshifter +: Upon your request, the SUPER ADVENTURE R can be equipped with a quick shifter that allows slick, clutchless up- and downshifts under any load. It reads and responds to your riding, so the shift action is fast when you are, but buttery smooth at half-throttle. MSR (Motor Slip Regulation): The optionally available Motor Slip Regulation (MSR) works in the opposite direction of the MTC. If, due to quick downshifts or abrupt throttle chopping, the engine drag torque is too high, the ride-by-wire system opens the throttle exactly as much as is needed to prevent the rear wheel from drifting. With the help of MSC, this system is also lean-angle sensitive. Safety first, but the pleasure that comes with it is always a very close second at KTM. HHC (Hill Hold Control): The optional Hill Hold Control (HHC) prevents the motorcycle from accidentally rolling backwards. It identifies if the bike is on a slope and at a standstill. After the rider has released the brake, the function automatically keeps the brakes applied until you are moving forward. In short: a smooth take-off, time and time again. KTM MY RIDE: Your smartphone can be tethered to the bike via Bluetooth, giving you full control over incoming calls and an audio player. All the information pops up on the bike´s display and you manage this optional extra with the mode switch, keeping your hands where they belong. On the handlebar. MTC (Motorcycle Traction Control): The Motorcycle Traction Control (MTC), a lean-sensitive traction control system, reacts immediately if the rotational speed of the rear wheel is disproportionate to the riding situation. In a matter of milliseconds, MTC reduces the engine output with an extremely smooth, barely perceptible intervention at the throttle valves, until the system has reduced slippage to optimum proportions for the selected ride mode and current angle of lean. Depending on that mode, MTC allows four different levels of traction slip at the rear wheel. ‘Sport’ is game for respectable drifts and a perceptible amount of slippage, ‘Street’ keeps things smooth for comfortable, controllable riding with full engine power, ‘Rain’ is all about early intervention and maximum grip in the wet and ‘Offroad’ allows up to 100% of slippage - i.e. double the wheel speed - for ambitious offroad use. And that’s not the end of it. Daredevils, we give you: the off-switch.